Simple question, right? But the answer isn’t necessarily as easy. One easy way to find out is by completing our online application. EHCS will research your Medicaid plan and work with them to confirm your benefits and determine which breast pumps you’re eligible for. Let’s start with defining Medicaid. You’d think that would be easy, but it’s not as black-and-white as you’d think. The Health Insurance Association of America says that Medicaid is a “governments-sponsored insurance program for individuals of any age whose resources and income are insufficient to cover health care.” Under the Affordable Care Act, you can qualify for Medicaid if you make less than 133 percent of the federal poverty line (currently $15,521 for an individual and $31,721 for a family of four). Currently nearly 70 million people (or 1 in 5 Americans) are enrolled in a Medicaid plan or Children’s Health Insurance Program. Medicaid programs are funded by state and federal dollars, but states manage their own programs, which is partly why it’s hard to say, “yes, Medicaid covers breast pumps.” Another issue is that some states used managed care organizations (MCOs) to administrate their Medicaid programs, and each of those has its own rules. The good news is that many Medicaid and managed Medicaid programs cover breast pumps, and your local WIC (Women, Infants and Children) office will be a great help in breastfeeding successfully. So defining Medicaid isn’t simple, but finding out if you’re covered is. Edwards Health Care Services (EHCS) is in network with more than 40 state Medicaid programs (including plans in Ohio, Kentucky, Michigan, Massachusetts, Texas, Illinois, Virginia, South Carolina, Indiana and more) throughout the United States, and they each have different guidelines. Typically, Medicaid programs will not cover the breast pump until the baby is born, but we can help you get the process started so all you have to do is let us know when the baby arrives! We will handle the paperwork between Medicaid and your doctor’s office (a prescription for a breast pump is required), while you focus on getting ready for your new baby! 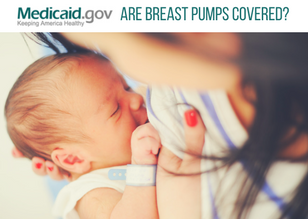 Find out if your Medicaid covers breast pumps! We carry several Medicaid-approved, double-electric breast pumps, and we’re happy to talk with you about which pumps meet your eligibility requirements and needs. Just email EHCS at breastpumps@myehcs.com or fill out this form to get started!